Southern Star Yorkies Traditional & Biewer Yorkshire Terrier Puppies for sale in Georgia, Tennessee, Alabama, South Carolina, North Carolina and Florida. Welcome to Southern Star Yorkies! 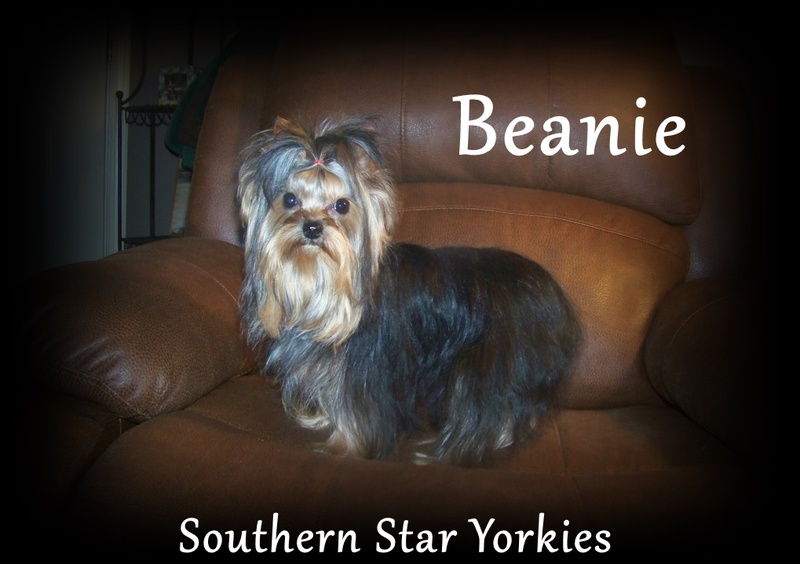 Southern Star Yorkies is located in the beautiful West Georgia area, conveniently located just West of Atlanta off of Interstate 20.We offer quality Biewer & Yorkshire Terrier puppies with wonderful Champion European, Russian & Canadian bloodlines. Our lines include, Lake Buena Vista, Nove Kasio, Stribrne Prani, Hunderwood, Guemart, Pastoral, Durrer, Mini Shop, Rigair, Devil's of York, Knight of Blue Cross, Pinkerlton, Lonely Tunes, A Slice of Cake, Rothby, Parkside, Crosswinds, Millmoor, Clarkwyn and Stardust. 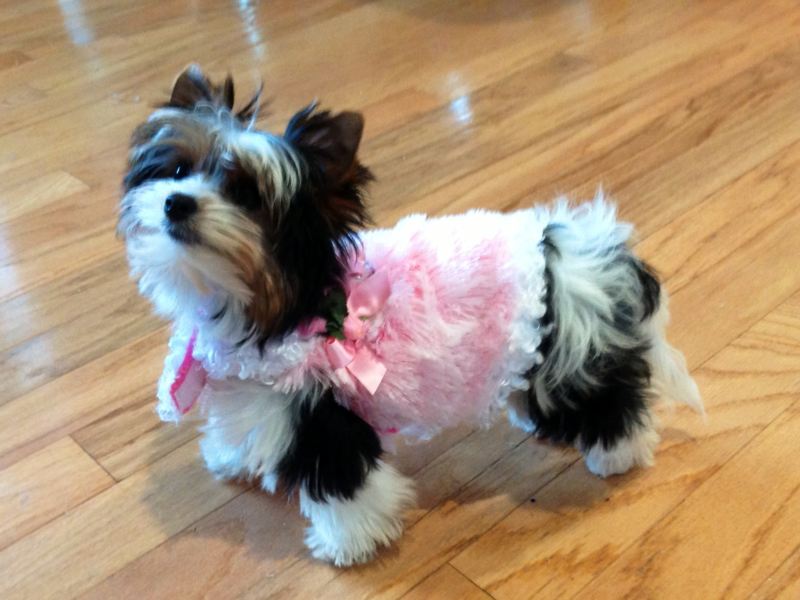 We take great pride in raising beautiful, healthy, quality Yorkshire Terrier puppies. We strive to maintain an uncompromised quality and stick as close to the Yorkshire Terrier breed standard. We stand behind our puppies with a One Year Health Guarantee against any Heart, Kidney or Liver defects. Your new Yorkie puppy will come with his/her 1st set of vaccinations, tail docked and Dewclaws removed. The breed standard for the German Biewer is an intact tail. Our Biewer puppies tails are left intact, we DO NOT dock them. We start de-worming at 2 weeks of age and continue every 2 weeks until they leave for their new home or until 12 weeks of age, whichever comes first. Our Yorkie babies are born in our puppy nursery inside our home, away from all our other pets. We like for them to feel secure and as stress free as possible. All of our adult Yorkies are pets and have access to our home. Some of our adults stay inside our Air Conditioned/Heated Kennel in dog runs. 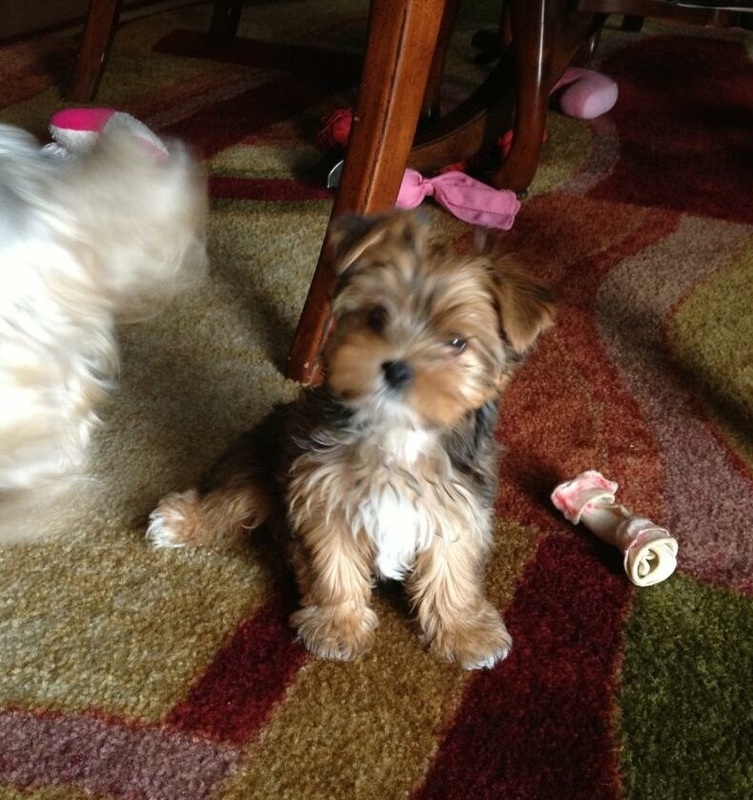 The average age we allow our Yorkie puppies to leave is 10-12 weeks, depending on the maturity level of each puppy. We do prefer to keep our babies until they're a little older than some breeder's. We feel it's irresponsible for a breeder to allow puppies to leave at 6 or 8 weeks of age, most are not eating solid puppy food well at that age. The longer they nurse, the healthier they will be. We want to make sure that all our puppies are as healthy as possible and eating solid puppy food well before they leave for their forever homes. We do offer partial delivery, as we're close to Alabama, Tennessee, South & North Carolina and Florida. You're always more than welcome to visit our home to select your new puppy. Our puppies health is our TOP PRIORITY!! We also offer shipping to anywhere in the United States, delivery is made by our Personal Flight Courier that flies with each puppy. The puppies never leave their sight!! They're well taken care of and never left alone at any time and receive plenty of love along the way. You'll meet the Courier and pick up your puppy at your nearest airport. The Courier fee for this service ranges from $350 to $400. The price depends on which part of the US you live in. This fee would need to be added to the price of the pup, as we have to pay our Courier when we meet and drop off the pup at the Atlanta Airport. We NEVER ship our babies as cargo or without a Courier that travels with them. All of our Traditional Yorkies are AKC Registered.....Our Biewer Yorkshire Terrier's are registered in Germany with the IBC (International Biewer Yorkshire Terrier Club) and dual registered with the CKC Registry here in the US. Pricing varies depending on evaluation of the pup, structure, temperament and estimated adult weight, along with the type of registration you desire (Pet Limited or Full Breeding Rights). Pet Limited must be spayed or neutered before you receive the pet registration papers. Full Registration allows for Breeding and Showing. Please visit our "Buyer/Seller Contract" page and read our sale's contract. You will learn how to pre-order the required NuVet Vitamins and discover what puppy food we currently feed our Yorkie babies. The Yorkshire Terrier is an ideal dog for families, very loving, they will give you endless hours of entertainment. They're smaller than most other dogs, which makes them the perfect pet if you live in a smaller apartment. Their lifespan is usually 12-15 years and some have been known to exceed that age with proper care. The Yorkie is the perfect pet for you to enjoy for years to come.We'll be happy to answer any questions you may have about our adoption process. We look forward to hearing from you soon. When making your decision to purchase a Yorkie Puppy......PLEASE!!!! Let good common sense guide your purchase, and choose a reliable well recommended source that you know has well satisfied customers. Don't look for a bargain, because you may end up paying many times over in future veterinarian bills, not to mention disappointment and heartache if your pet turns out not to be well. Buy a healthy Yorkie puppy with a good disposition, one that has been properly socialized and likes being around people. We offer Full Registration to only a select clientel. If you're interested in acquiring a Yorkie puppy for breeding purposes, we'll be happy to talk to you. We can help you select our best for your breeding program. We do however charge an additional fee for Full Registration. 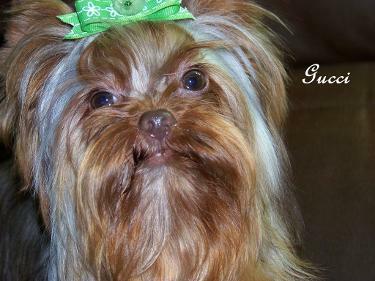 by phone @ 678-665-8305 or by email: sydney@southernstaryorkies.com. Please read our guidelines below for being added to the waiting list for a puppy and our policy for applications and Reserve fees. From time to time, people tell me to lighten up...."it's just a dog", or that's a lot of money for "just a dog". They don't understand the distance traveled, the time spent, or the costs involved for "just a dog". Some of my proudest moments have come about by "just a dog". Many hours have passed and my only company was..."just a dog", but I didn't once feel slighted. Some of my saddest moments have been brought about by "just a dog" and in those days of darkness, the gentle touch of "just a dog" gave me comfort and reason to overcome the day. If you think it's "just a dog", then you probably understand phrases like "just a friend", "just a sunrise", or "just a promise". "Just a dog" brings into my life the very essence of friendship, trust and pure unbridled joy. "Just a dog" brings out the compassion and patience that makes me a better person. Because of "just a dog? I will rise early, take long walks and look to the future. So for me and folks like me, it's not "just a dog", but an embodiment of all the hope and dreams of the future, the fond memories of the past, and pure joy of the moment. "Just a dog" brings out what's good in me and diverts my thoughts away from myself and the worries of the day. I hope that someday they can understand that it's not "just a dog", but the thing that gives me humanity and keeps me from being "just a woman". So the next time you hear the phrase "just a dog", just smile, because they "JUST DON'T UNDERSTAND"!! In order to be fair for those who are sincerely interested in purchasing one of our pup's, we have a waiting list. 1. All requests must be accompanied by a puppy application. The application can be submitted straight from the website. PLEASE READ.....NEW POLICY concerning applications for puppies & non-refundable Reserve Fee's to hold. From this point forward, if you fill out a puppy application, you MUST also place a $100 Commitment Fee. This Fee WILL be deducted from the price of the pup. When you select the puppy of your choice @ 5 weeks, you will then pay the remaining Non-Refundable Reserve Fee for the puppy. The remaining Reserve Fee will be either $150 or $400, depending on the price of the puppy. I'm sorry to have to do this but I've held many puppies for weeks, only to have the applicant end up cancelling due to family or health issues. The initial Commitment Fee can be paid through PayPal using the email address sydneyderington@att.net. If your checking account is linked to your PayPal account you can send the $100 Commitment Fee as "Friends & Family" and you will not have to add the 3.5% fee that PayPal charges per transaction. I can also send an invoice to your email through Square if you do not have a PayPal account. Square charges a 3.3% fee per transaction. If your application for a puppy is denied, your $100 Commitment Fee will be refunded. The initial Commitment Fee is non-refundable if YOU change your mind. 2. You will be put on a MALE or FEMALE waiting list in the order that your application was received (First Come, First Serve Basis). 3. Toy size pup's will not be available until 10-12 weeks of age. We will contact each prospective buyer when the puppies are 5 weeks of age, by order of their application. You will have 48 hours to decide to purchase from the available litter. If you pass on the current litter, you will remain on the list until you find the puppy of your choice. 4. Once you commit to a certain puppy, your non-refundable Reserve Fee is not transferable to another pup. When picking up, only cash will be accepted. If shipping is required the balance due plus the Courier Fee will need to be paid 10 (ten) days prior to shipping your puppy. The only acceptable forms of payment are: Official Check (not a Cashier's Check), US Postal Money Order (no other Money Order's will be accepted) or PayPal. I can also send an invoice for payment to your email through Square. All Official Check's and US Postal Money Order's are made payable to Sydney Derington. 5. We reserve the right to refuse a sale to anyone if we feel it's not in the best interest of the puppy. There will be ABSOLUTELY NO SALES to pet stores, puppy brokers or puppy mills.